The new edition of this well-established book includes in particular the new Rome I Regulation (Regulation (EC) No. 593/2008) and the consequences resulting from the transformation of the Rome Convention into a Community Regulation and encompasses all relevant types of cross-border contracts. The first part deals with the determination of the law governing the contract. Here, the process of the unification of law is described, taking into account in particular the Rome I Regulation, i. e. its historical background – and therefore also the Rome Convention – its scope of application, its relationship to other Community instruments as well as existing international conventions and its different choice of law rules. Further, this first part contains practical advice for the drafting of contracts. 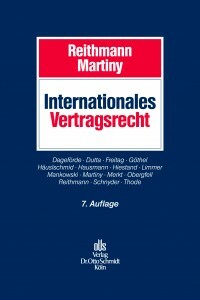 The second part of the book is dedicated to the scope of the law governing the contract as for instance consent, material validity, the interpretation of contracts, the content of contracts, defective performance, burden of proof, limitation of actions, voluntary assignment, subrogation, multiple liability and the transfer of obligations. The third part deals with non-contractual obligations and culpa in contrahendo and therefore refers to the Rome II Regulation: In particular, the book addresses the question of freedom of choice (Art. 14 Rome II) and the basic principles which are common to unjustified enrichment and negotiorum gestio such as accessorial connection, common habitual residence and manifest closer connection. Further, the law applicable to unjust enrichment, negotiorum gestio and culpa in contrahendo under the Rome II Regulation is described as well as its scope (Art. 15 Rome II). In addition, this part covers also subrogation (Art. 19 Rome II) and multiple liability (Art. 20 Rome II). The fourth part concerns overriding mandatory provisions (Art. 9 Rome I). Here, the first chapter is dedicated to the historical background of Art. 9 and gives an overview of this rule. The second chapter deals with the application of Art. 9 and therefore in particular with its scope, its (restrictive) interpretation and its effects. The third chapter addresses overriding mandatory provisions of the law of the forum (Art. 9 (2) Rome I), while the fourth chapter deals with mandatory provisions of the law of the country where the obligations arising out of the contract have to be or have been performed (Art. 9 (3) Rome I). The fifth and the sixth chapter are dedicated to foreign currency and to formalities. The fifth part, constituting the main part of the work, is dedicated to the different types of contracts: contracts of sale (including CISG); different types of contracts on the provision of services such as for instance contracts for work and services, leasing, guarantees, loans and brokerage agreements; further contracts on immovable property (here in particular the sale of land and ground lease); contracts on intellectual property; franchise contracts; commercial agency contracts and distribution agreements; contracts concerning the financial market; contracts of carriage; consumer contracts; transactions such as share and asset deals and joint ventures; insurance contracts and employment contracts. The sixth part deals with questions of agency and power of disposal. Therefore, the book contains inter alia chapters on the law applicable to agency, the power of disposition of insolvency administrators as well as different kinds of restrictions of the power of disposal. 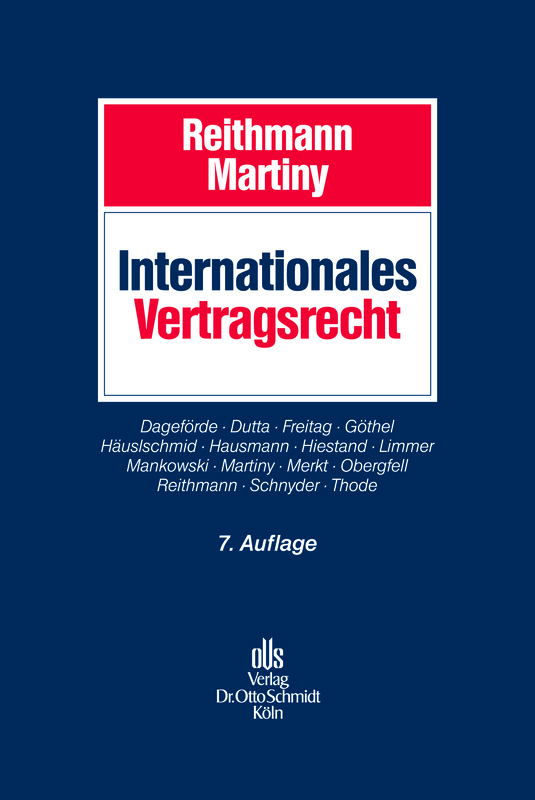 The seventh and last part of the book covers choice of court as well as arbitration agreements. More information on this book can be found on the publisher’s website, where it can be ordered as well. Previous post: The Enforceability of Forum Selection Clauses: Federal or State Law?